Prof. G. S Diwan was born on September 10th, 1901. He was an actuary. He dedicated his entire career for teaching Mathematics and Actuarial Science. In his memory, a G. S. Diwan memorial lecture is held in Mumbai every year. 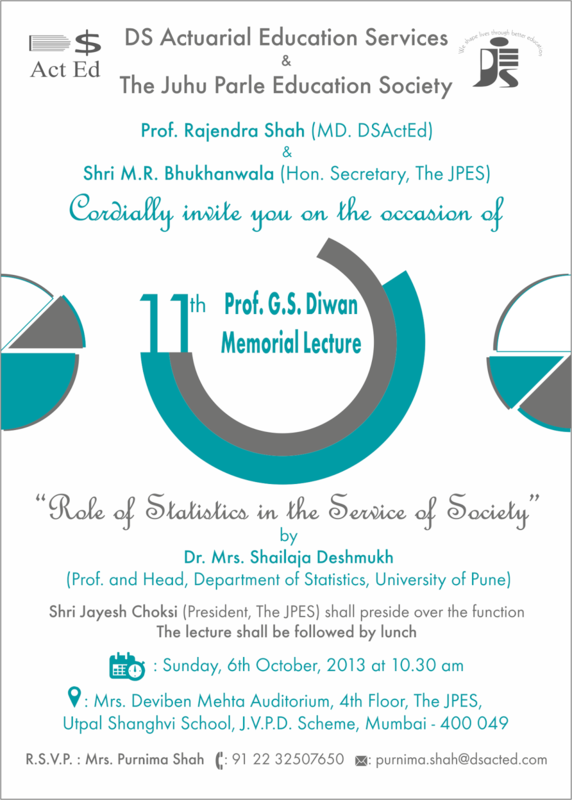 This year the 2013 G. S. Diwan memorial lecture will be held on Sunday October 6th, 2013 at 10:30 a.m. in Mrs. Deviben Mehta Auditorium at The JPES Utpal Sanghvi School in Juhu, Mumbai. 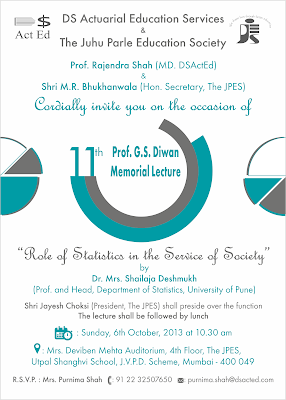 This is the 11th G. S. Diwan memorial lecture. This year's lecture will be delivered by Dr (Mrs) Shailaja Deshmukh. Dr. Deshmukh is a professor and the Head at the Department of Statistics, University of Pune. The topic for this year's lecture is Role of Statistics in the Service of Society. Abstracts of some of the earlier lectures in this series are available on this site. Mr. Jayash Choksi, President, The Juhu Parle Education Society will preside over this function. If you are a student or teacher of Mathematics, Statistics or Actuarial Science, we encourage you to attend this lecture. If you are a professional practicing these disciplines or if you are simply interested in these subjects, please attend this event and meet insurance industry veterans and actuaries. To attend this event, you must RSVP Ms. Purnima Shah. Please see the invitation above for additional details. This event is organized by DS Actuarial Education Services in association with Juhu Parle Education Society. Please contact for additional information.